Dr. Lauren Mummert, (far right) Board-certified Pediatric Dental Specialist at The Dental Center is participating in the LITTLE BLACK DRESS INITIATIVE for the Junior League of South Bend, Indiana. Dr. Mummert will wear the same black dress every day this week as a symbol of commitment to volunteerism and community activism. The campaign seeks to raise awareness for those in need in our community who have limited choices and resources. Also pictured from left to right: Board-certified Pediatric Dental Specialist, Dr. Richard Cohen & Pediatric Dentist, Dr. Patricia Gyasi, Hygienist; Ms Jen Leonard and Assistant; Erica Karmolinski (assistant). Our Dr. Cohen has traveled to Haiti once again to support Faculté d’Odontologie, Haiti’s only dental school. During his most recent trip, Dr. Cohen and his son visited for the first time with Health Volunteers Overseas (HVO) — a nonprofit organization that seeks to improve global health through education. “What is impressive about the HVO program and experience is that by teaching dental students, faculty and community dentists, I can pay it forward so that those dental professionals can then render better and more efficient dental care throughout their country,” Dr. Cohen said. 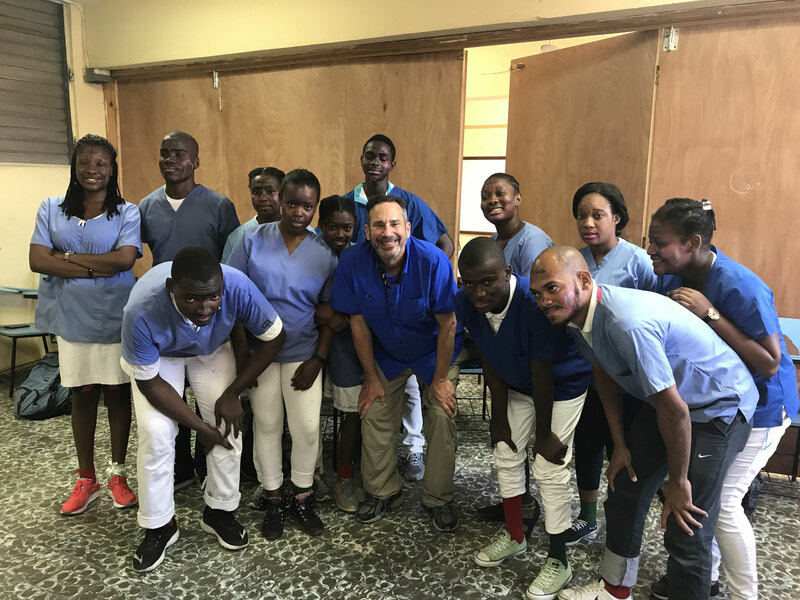 Dr. Richard L. Cohen from The Dental Center South Bend Indiana visited the Dental School in Port au Prince, Haiti. Dr. Cohen was sponsored by Health Volunteers Overseas located in Washington D. C.
Dr. Cohen visited the school from October 30th to November 4th. Dr. Cohen worked with Faculty members and students. He conducted training in both Pediatric Dentistry, Orthodontics, Preventive Dentistry and Community Health. Dr. Richard Cohen with some seminar members. He held a seminar on Silver Diamine Fluoride treatment options. The seminar was open to students, professors, and local Haitian dentists. Dr. Richard L. Cohen donated one of many textbooks to the only Dental School in Haiti. Accepting the ceremonial book: Dr. Samuel Prophete DEAN, Faculte d’ Odontologie and Dr. Christina Lafontant Secretary General, Faculte d’ Odontologie. 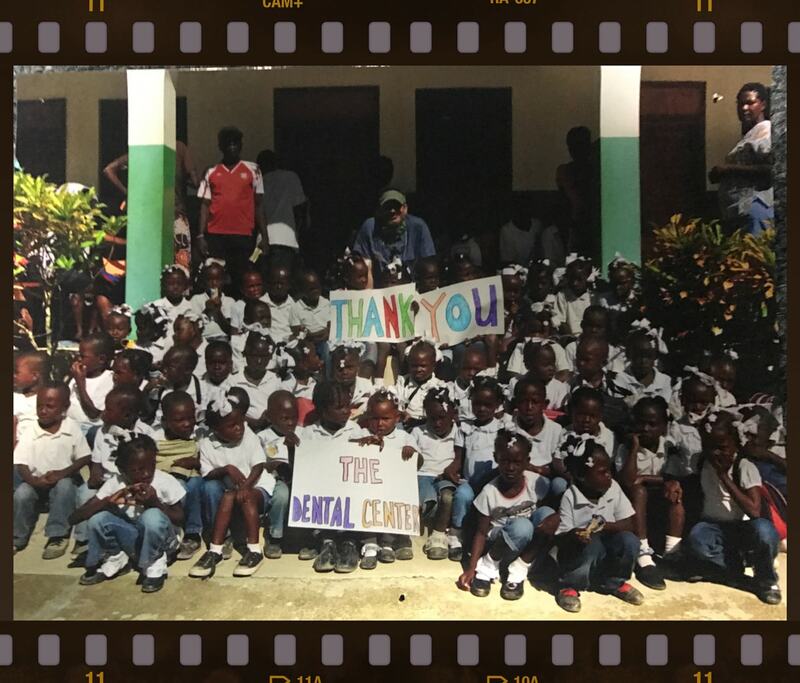 Both Dr. Prophete and Dr. Lafontant wish to thank The Dental Center, South Bend, Indiana and Dental Care Alliance for their support of this outreach project. Tina Oates visits Rainbow Learning Center in South Bend! Tina Oates pictured here with one of preschoolers who attends Rainbow Learning Center in South Bend. She regularly visits daycares and preschools in St Joe and Elkhart Counties as well as large corporate daycares such as Growing Kids, Starz Academy, Rainbow Learning Center, and La Petite Academy, as well as the community/city daycares, including those in private homes. Tina is always looking, finding and scheduling new places to visit to spread some dental health awareness to the little ones! 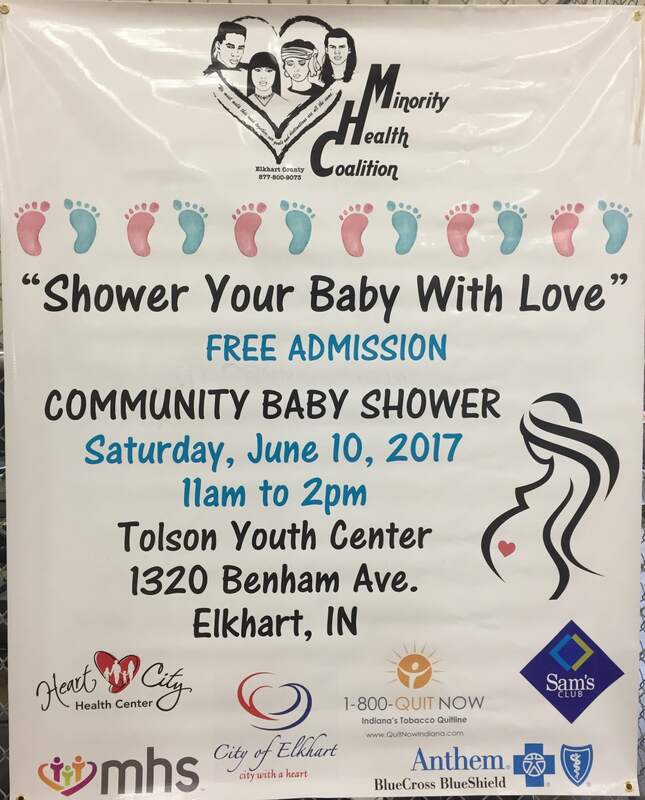 Tina from the Dental Center attended the 12th Annual Shower Your Baby With Love, Community Baby Shower sponsored by the Minority Health Coalition of Elkhart County on Saturday, June 6th. The 12th annual Silver Mile High Health and Fitness event this past Saturday, May 6th, was a huge success! Tina Oates was joined by Chloe Benham, Miss South Bend Teen, who’s been a patient of The Dental Center since she was little girl. Chloe is also pictured with little Hazel Lay who stopped by to visit the Dental Center booth. Frank Fitzhugh posing with Tina, he was the lucky raffle winner of a sonic toothbrush. 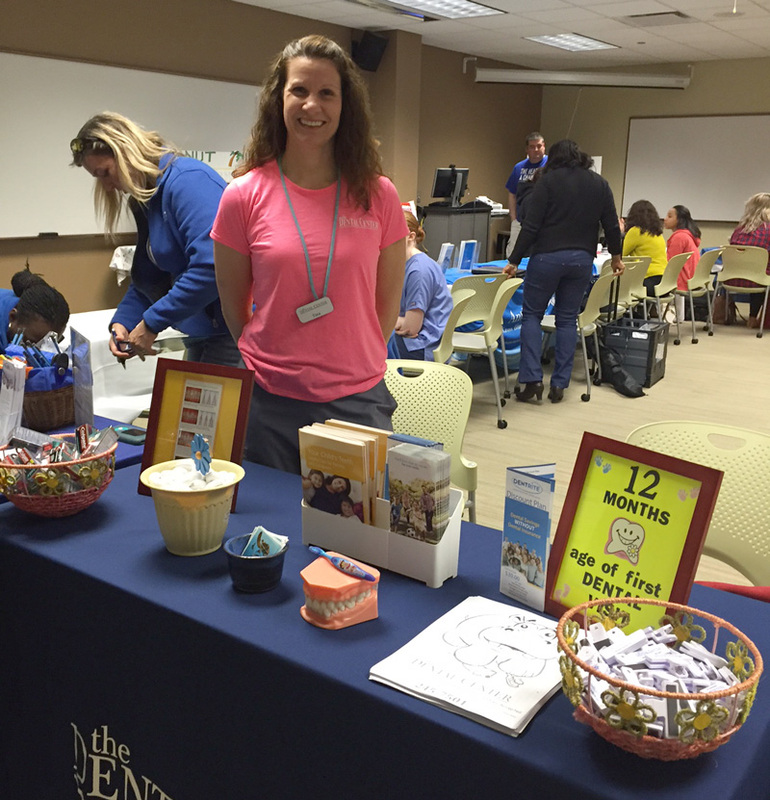 Head to Toe Health Care Event! 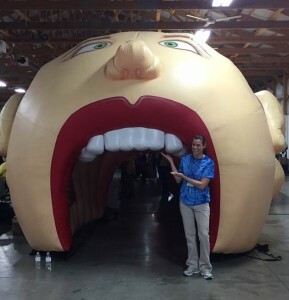 Here’s Tina with the best spot in the house, participating at the Head to Toe health care event, held at the Elkhart Co fairgrounds this past Friday night in Goshen, IN. 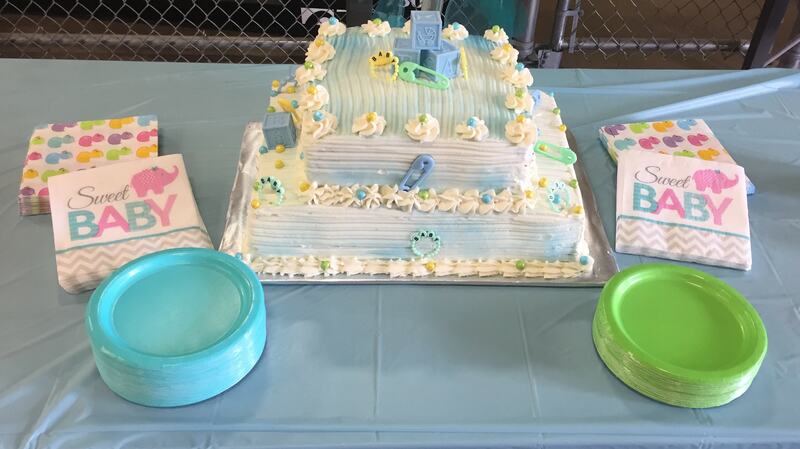 There was a huge turnout and as always the event was a big hit for both kids and adults alike! 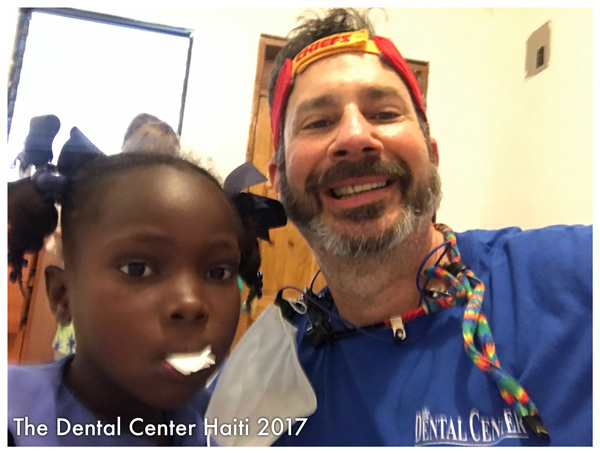 Dr. Cohen is back from his annual mission trip to Haiti where he joined other volunteers to help bring smiles to people in desperate need of dental care. February is National Children’s Dental Health Month and The Dental Center of Indiana teams are already gearing up! 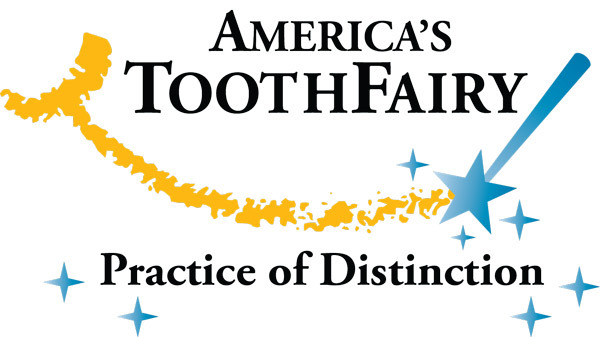 We are proud of our on-going commitment for helping children throughout Michiana have a healthy smile and honored that these efforts have been recognized as an America’s ToothFairy ‘Practice of Distinction’. We are eager to give back and help bring toothbrushes, toothpaste and other essential oral care supplies to kids in need through the America’s ToothFairy program. 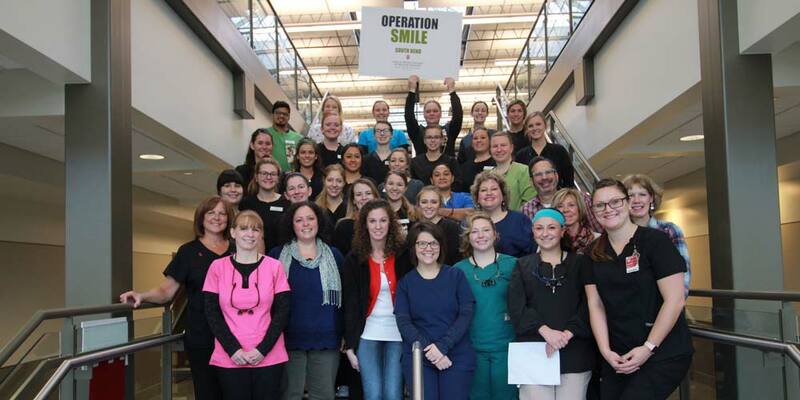 We were proud to provide free dental exams to local veterans during Operation Smile! Over the weekend, we helped around 40 vets receive free cleanings, exams and referrals for free extractions and fillings. Dr. Cohen, who is retired from the Army, along with some of the amazing team from our South Bend office joined dozens of other volunteers at Indiana University South Bend. Although there’s no way to repay military service, we are committed to helping our local vets keep their teeth healthy and clean through wonderful programs like Operation Smile. 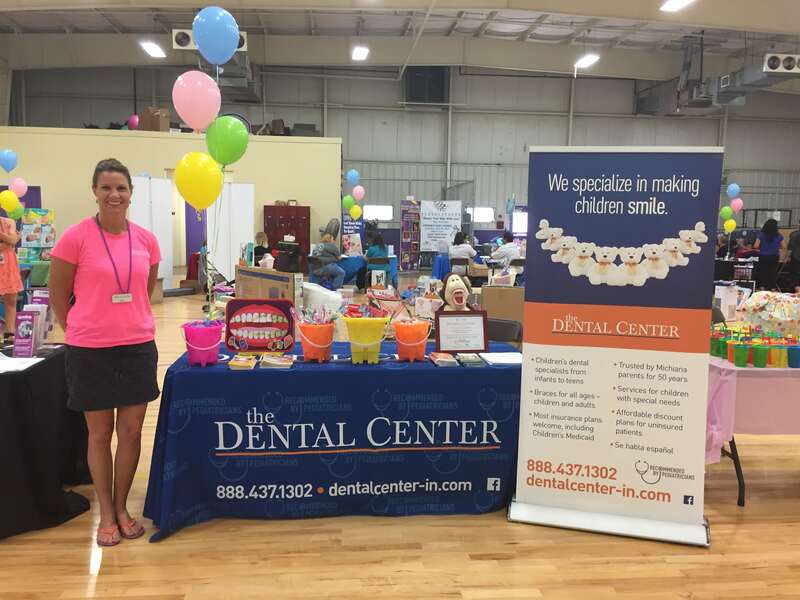 The Dental Center of South Bend participated in the Annual South Bend Community School Corp (SBCSC) Back to School Event held on Saturday, August 13th! The Dental Center of South Bend is proud to be hosting a table at the Annual Career Academy Health Fair again this year. 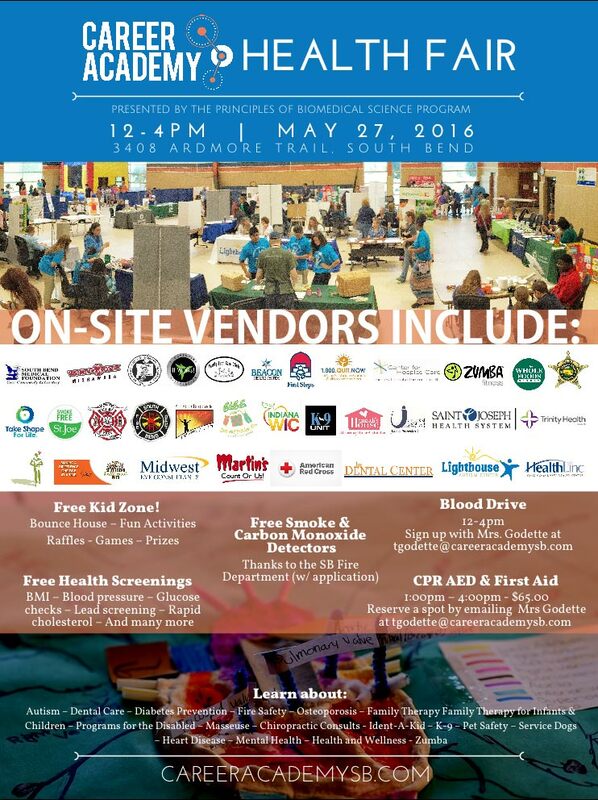 is on Sat, June 4th from 11am – 2pm. First 10 families will receive a gift certificate from local restaurants. Saturday: June 11th from 9am – 1pm. Get UP and GOshen is a free family wellness event. It begins in Shanklin Park, continues along the Millrace Trail, and ends at the Goshen Farmer’s Market. (The approximate distance from the park to the Farmer’s Market is 1 mile.) Participants will explore fun & interactive learning stations in the park and along the trail that focus on nutrition, fitness, health & safety. The Dental Center proudly donated several hundred items including floss, toothpaste, and hand sanitizers in support of the Elkhart Vettes for Vets (Corvette Club) fund-raising event “Vettes for Vets” at the Indiana Veteran’s Home in West Lafayette, IN on May 7, 2016. Their efforts will support the Veterans of our country by supplying them with personal care and other items they may not be able to get themselves. Dr. Gary Metzler worked with Dave Masiokas, a member of the Elkhart Corvette Club to raise awareness and arrange the event. This past Saturday several of the Dental Center staff members donated their time and services to patients in need. Dr. Lisa Dekkar-Reed coordinated the Dental Center’s involvement for the event. Two of our Pediatric Dentists -Dr. Reed and Dr. Richard Cohen- donated their time, treating patients from 6:00am until 4:00pm. Seven of the Dental Center’s assistants participated in shifts throughout the day: Candy Swathwood, Kelsey Ream, Stephanie Gallegos, Lisa Good, Jenny Lohmuller, Trina Schultheis, and Candice Campero Tina Oates worked a booth at the Health Fair for The Dental Center providing dental awareness, information and give-a-ways. The staff of The Dental Center South Bend Pedo proudly wearing their “Stand For Something” t-shirts & joined by the Tooth Fairy raise awareness and donations for children with Cerebral Palsy. So far they have raised over $1,000 for “vision activated” talking computers that allows a child to speak what has in the past been trapped in their mind but they could not physically express. This very important cause is their heartfelt effort to support a member of the office’s staff whose child has Cerebral Palsy. Below is Addison Schrock, she was our grand prize winner of the Kindle Fire for the coloring contest! Saturday, October 24th The Dental Center participated in two Trunk or Treats events held at Better World of Books in Mishawaka & St. Anthony’s Catholic Church & School in South Bend. Even though it rained a few times, they were both a big success. Tina, the tooth fairy, along with staff from The Dental Center of Granger, sponsored a table at the annual Haunted Hayride on October 22nd, presented by Martin’s, KOA Campgrounds and the St. Joseph County Police D.A.R.E. 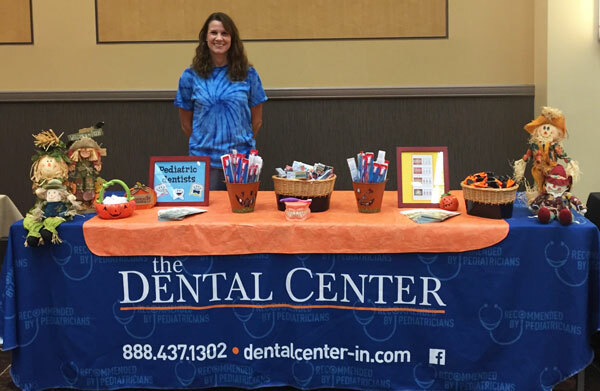 The Dental Center of South Bend was a proud sponsor at the annual South Bend Education Foundation Truck Pull & Family Fun Fair, held inside the stadium at Four Winds Field on Saturday, October 3rd. The annual event raises funds for school projects, each school competes to see who can pull a semi-truck the fastest. Working at the Outpatient Surgery Center for more than 35 years, Dr. Robert Austgen has always treated every patient like family. Providing a wide range of dental procedures to children and adults with special needs, and from diverse backgrounds, Dr. Austgen knows how to keep his patients comfortable and calm. Always joking, he makes his patients laugh and is often seen playing with children in pre-op to help keep them relaxed. His associates have described him as having “a demeanor of a loving grandfather” with his younger patients. A highly professional and understanding individual, Dr. Austgen is more than a team player. Constantly following protocols and interacting with his staff, he ensures that every day flows seamlessly. Dr. Austgen is always willing to listen, making him a caring, loving, and tenderhearted doctor with a passion for seeing others smile. His dedication to his craft and kind personality make him a true professional gentleman. The Dental Center of Mishawaka will be sponsoring a booth at the Summerfest this year. Mishawaka Summerfest will be held in Merrifield and Crawford Parks Friday, June 26th from 6:00 to 10:45 pm and Saturday, June 27th from 7:00 am to 10:00 pm. 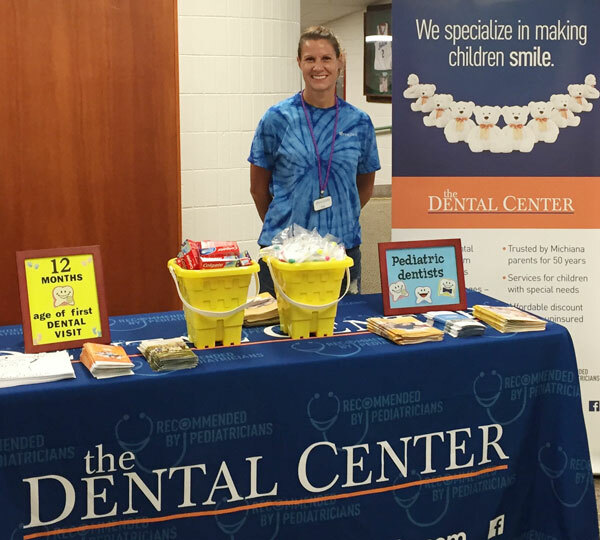 Tina stayed busy answering questions and handing out goodies to all who visited The Dental Center booth. Attendance was over 2,000 and the token-collection totaled 2,200-plus alone. Thank you all for your support in making the 10th Silver Mile Run for Education & Health such a success! 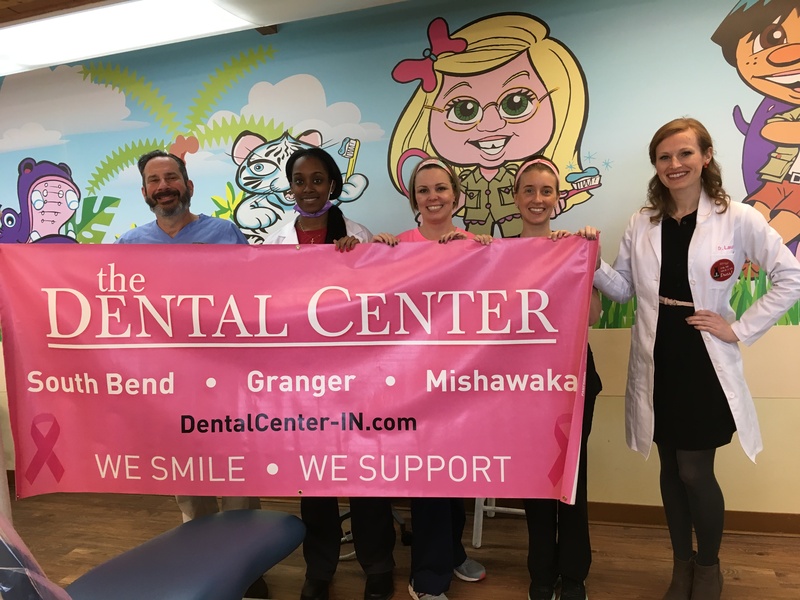 Several times a month, Tina Oates, Registered Dental Hygienist, visits the WIC (Women, Infants & Children) support center for the underserved in downtown South Bend. Tina offers educational demonstrations and information regarding the effect of good oral health on Moms to be, infants and young children. Her passion for the care of small children and their overall well-being along with educating Moms and Moms to be is heartwarming and much appreciated. 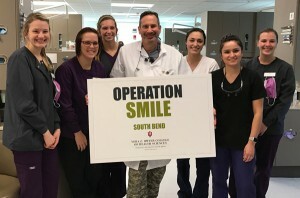 In November the Dental Center of South Bend volunteered their services to the Indiana University South Bend Operation Stand Down, providing dental services to Military Vets. 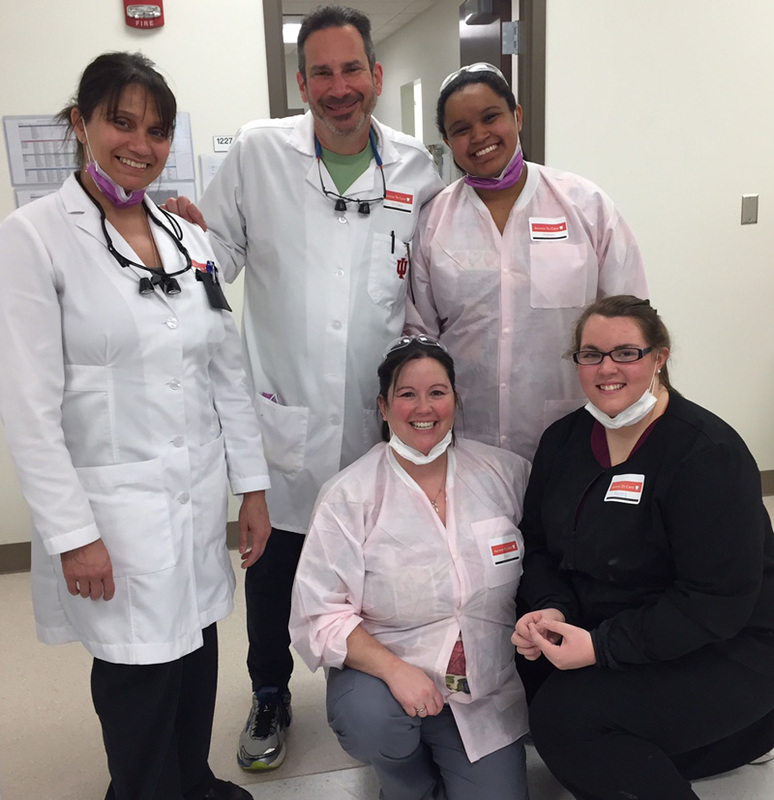 Dr. Cohen volunteered his time in April of this year at the IUSB Sealant Clinic. Dr. Richard L. Cohen, DDS has been on missions to Haiti in March 2010, March 2011, and March 2013. 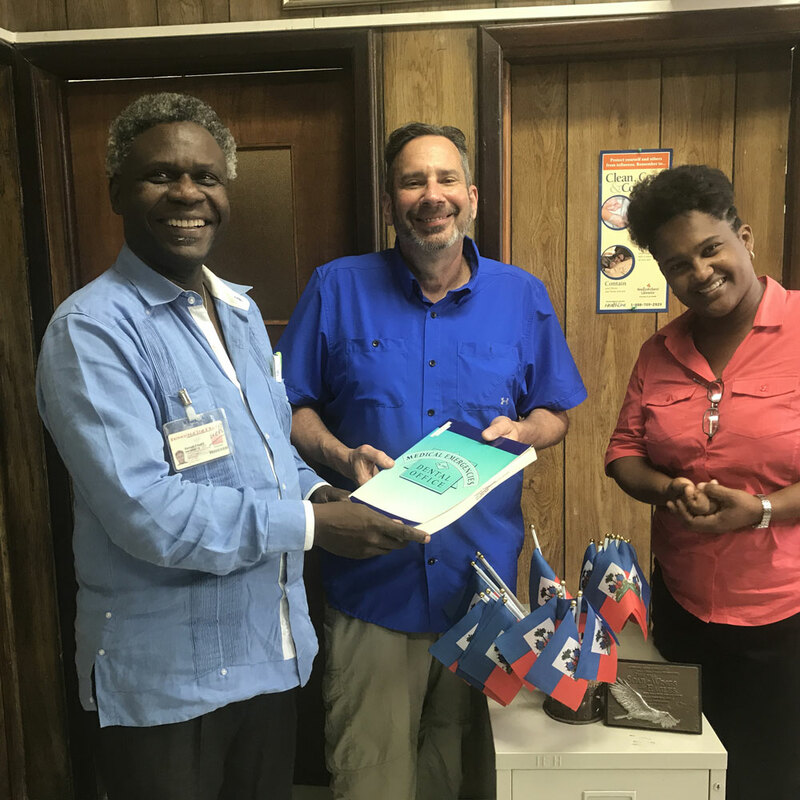 Jeannie Cook and DCA have supported Dr. Cohen with supplies, especially in 2010 after the devastating earthquake in January 2010 (epicenter in Port au Prince). Dr. Cohen will be going again in March 2015 with The Dental Center hygienist Amber Brown and his wife Dana Cohen. They will go to small isolated villages with no paved roads, no electricity, no clean water and no sanitation. He will treat approximately 50 patients a day for 5 days; all treatment is limited to extractions or removal of oral pathological lesions. Please visit our page in March for details & photos of their trip. The Dental Center of Indiana is passionate about children’s dental health and our local community. We are continuously looking for ways to give back. February is National Children’s Dental Health Month and we are proud to participate in the ADA’s Give Kids a Smile Program. We have worked with local high schools to offer college scholarships to graduates and provide students with important information on maintaining proper oral health. Each year we sponsor various community events, host drives for Toys for Tots and provide dental health supplies where needed. The Dental Center of Indiana offers free resources to local organizations and community members including educational materials and oral health screenings. We don’t just support the people of South Bend, we support the animals too! We have partnered with the Potawatomi Zoo to care for the oral health of their furry family. Our dentists have performed root canals, extractions and cleaned the teeth of leopards, river otters and more. Click here to visit our blog for more information. Tina “Tooth Fairy” Oates is a Registered Dental Hygienist and our local Community Dental Health Educator. She can often be seen with our resident tooth mascot visiting community centers, boys and girls clubs, schools, daycare centers and healthcare events throughout South Bend. She can be seen at the local Crock Fest, Zoo Boo, and more, providing the community with dental health education, offering tips on maintaining a healthy diet, demonstrating proper brushing and flossing techniques and spreading oral health awareness throughout South Bend. 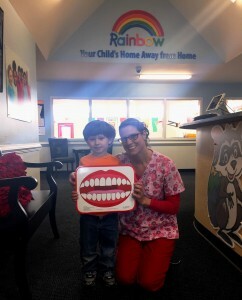 We are proud to work with Tina, community residents, businesses and organizations in South Bend to improve oral health. Visit us on Facebook for more information and to learn where Tina “The Tooth Fairy” and the Tooth Mascot will be next.